PLO Chairman and President of the Palestinian Authority - Mahmoud Abbas - was clearly not happy with the remarks made by President Bush on the occasion of the 60th Anniversary of Israel’s reconstitution as an independent Jewish state within its biblical homeland 2000 years after it had last flourished there. Regrettably a more balanced position is what Abbas needs at this time when it comes to the Jewish people - something he has lacked and continues to lack. 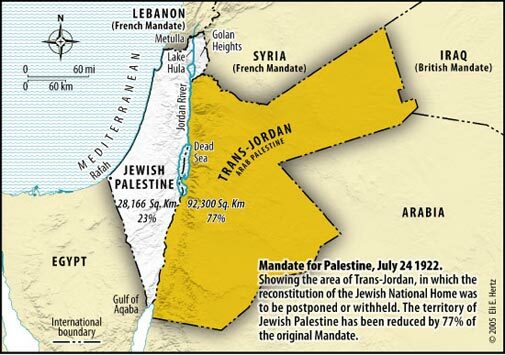 “ While the Jews had thus been dispersed over the world, they had never forgotten Palestine. If Christians have become familiar through the Bible with the physiognomy of the country and its place names and events that happened more than two thousand years ago , the link which binds Jews to Palestine and its past history is to them far closer and more intimate. Judaism and its rituals are rooted in those memories. Among countless illustrations it is enough to cite the fact that Jews, wherever they may be, still pray for rain at the season it is needed in Palestine. And the same devotion to the Land of Israel, Eretz Israel, the same sense of exile from it, permeates Jewish secular thought. Some of the finest Hebrew poetry written in the Diaspora has been inspired, like the Psalms of Captivity , by the longing to return to Zion.” (pp 8-9). Arab leaders then refused to accept the truth inherent in those words - just as Abbas today refuses to accept the words spoken by President Bush in the Knesset. “the historical connection of the Jewish people with Palestine and to the grounds for reconstituting their national home in that country”. This recognition affording the Jewish people the right of self determination in Palestine did not take place in isolation but as part of a series of international obligations that granted the Arabs the right to self determination in what today is called Lebanon, Syria, Iraq, Saudi Arabia and Jordan - an area 99.99% larger than the size of former Palestine. President Bush had made it clear to Abbas four years ago that the successful outcome to his Roadmap involved Abbas accepting Israel as the Jewish State existing alongside a 23rd Arab state that would be created for the Arab residents of former Palestine under the President’s plan. Yet the idea of a Jewish State has long been anathema for Abbas since his days in exile in Tunis with Yasser Arafat more than 25 years ago. He has been unable to get this monkey off his back as he continues to lead the Palestine Liberation Organisation whose Charter rejects the very words uttered by President Bush in the Knesset last week and by the Peel Commission six decades ago. That is not the historical perspective President Bush expressed in the Knesset last week. Whilst Abbas refuses to recognise the President’s perspective - and his vision - then Abbas’s ability and competence to negotiate any form of settlement with Israel will be rendered totally impotent. There were Arab leaders such as Anwar Sadat of Egypt and King Hussein of Jordan who were prepared to make the quantum leap and recognise Israel as the Jewish State - a jump that Abbas is still obviously not prepared to take judging by his reaction to President Bush’s speech in the Knesset. Abbas’s outburst at President Bush’s remarks indicates that he is just one more Arab leader in a long line of failed leaders who refused to accept the idea of Jews having their own state and as a result ensured continued suffering and humiliation for those whose national interest he was supposed to advance. He - like those failed leaders who preceded him - has surely lost the plot and needs to get off centre stage.